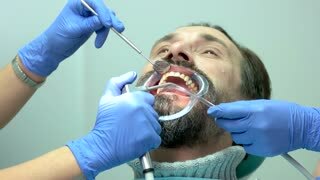 Dentist using antibacterial spray before start the procedure with patient. 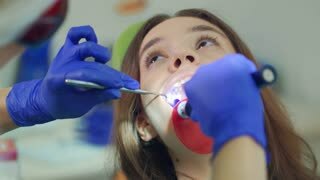 Dentist using ultraviolet light. Work of stomatologists with patient. Dentist using curing light. Two stomatologists with a patient. Patient and hands of dentists. Dental doctor using water syringe.